There are some emotions that render us exquisitely vulnerable. Grief is one of those. These last few days, the grief that only a mother of adoption loss can know has been my constant companion. I am left feeling raw and wildly exposed to the vicissitudes of others, unsteady and unsure of what direction to take next. Reunion has a way of doing that to a woman. Fortunately, grief also brings with it information about ourselves and others, information that can transform us and our relationships. Grief can empower us, if we let it. And so I am letting it. To all the first mother and adoptee bloggers: Keep speaking, even when others try to silence you. The world needs our words, our stories, our truth. The authority of your lived experience matters. If you don’t know about the 501c3 organization “Saving Our Sisters,” you should! It is a grassroots network of mothers of adoption loss and family preservation activists helping expectant and new mothers and their babies avoid the trauma of adoption relinquishment. You can read more about it on the Saving Our Sisters Facebook page or make a donation through the CUB website’s donation page (donations are tax deductible). 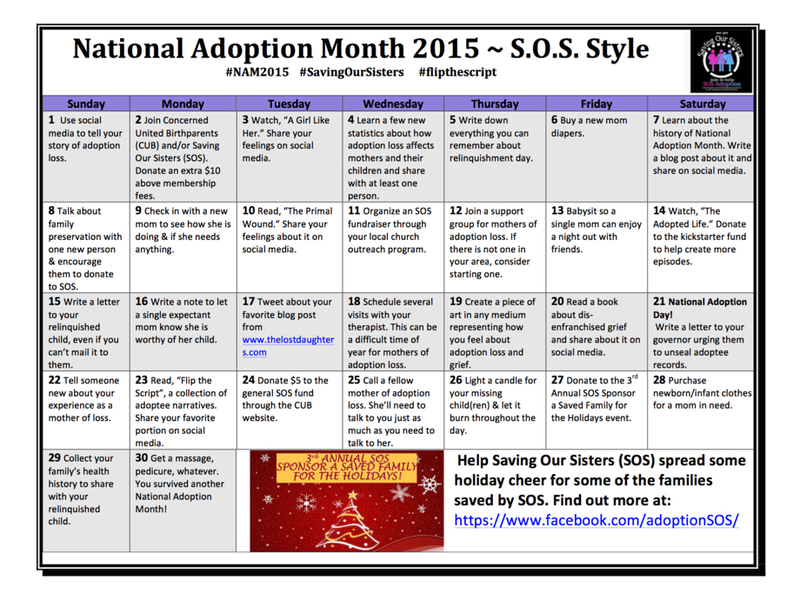 It’s that time of year again when, by Presidential proclomation, we Americans get to “celebrate” the destruction of the natural family National Adoption Month. Yipee and pass the streamers? Here’s a PSA to those of you who “celebrate” National Adoption Awareness Month: Remember that many adoptees like me are not so keen on it. Adoption isn’t just about love. It’s not based in altruism. It’s a multibillion dollar business where there’s a clear buyer, seller, and product. It operates within violence, especially violence toward women. As an institution, adoption has a history of telling lies, like it did to my mother. As an institution, adoption has a history of taking advantage of women in vulnerable situations, like it did with my mother. As an institution, adoption has a history of favoring privileged women at the expense of disadvantage women, like my mother. As an institution, adoption has a history of erasing the lives of women, like my mother who passed away in November of 1985. And released just in time for National Adoption Month, a new anthology of adoptee voices, “Flip the Script: Adoptee Anthology Project (The AN-YA Project).” Get it. Read it. Learn from it. I had the “pleasure” of tangling with her a few years ago. I am one of those her followers decided to “out” as a “bad birth mother” because I don’t spout the dominant cultural rhetoric about LDS adoptions. What the…??? Why would she want to connect with me professionally? Jessa is a “minder,” much like those of Scientology. Her goal and objective is to keep birth mothers mute, deaf, and powerless before the adoption industry and adoptive parents. It’s National Suicide Prevention Week 2015 here in the US and this is difficult reading for me. Why? Because I unknowingly put my daughter at a four-fold risk of suicide. What mother in their right mind would do that???? How is THAT supposed to be a blessing, dear LDS church? How is an increased risk for suicide “about love“? This adoption truth would have been a game changer for me. I would have never relinquished her for adoption. I was promised she would grow up whole and happy because she had the magic elixir of Mormondom – two parents who were sealed in the temple. It was supposed to be the secret sauce that protected her from depression and low self-esteem, among many other things. But I was lied to. So yes, this is difficult, but necessary reading. Talking about suicide is hard and uncomfortable. Talking about it in connection with adoption–which often has much joy but is more complex than people realize–is challenging. And we need to talk, and keep sharing information and resources. I am pleased to share with you my article “Understanding Why Adoptees Are At Higher Risk For Suicide,” published today by Forefront, a University of Washington collaboration of the UW School of Social Work, UW Communication, UW School of Nursing, and UW College of Education. Adoptees often don’t know their medical histories, which may include depression and other illnesses. Adoptees don’t want to upset their adoptive parents with concerns about depression or what could be seen as ingratitude. 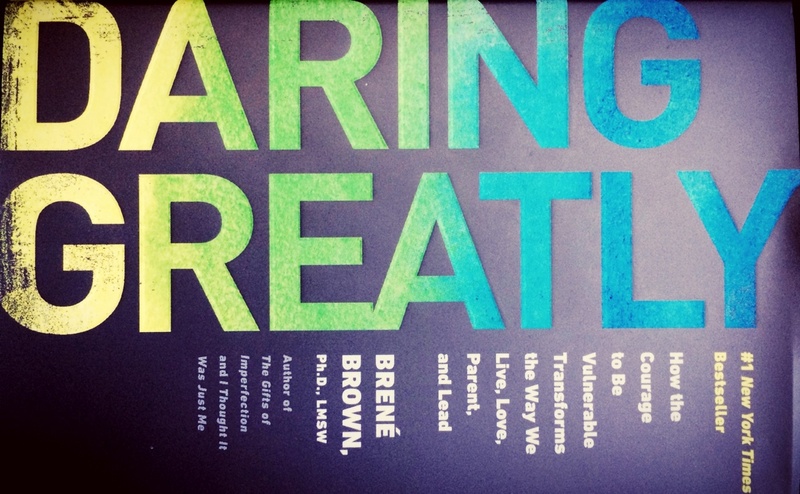 I don’t write many letters to you lately, but today I echo Dr. Brown’s words: If we are ever to find our way back to each other, past the shame that is the essence of adoption, it is because we support each other in the process of becoming real to each other again. So today, I set down the list of what a “good” LDS birth mother is supposed to be. I set down the stony expectations of my religion and my culture. They have sought to invalidate our connection, to convince both of us that we are no longer real to each other. But you are real. Just as Poppy is my real daughter, so are you. You are not a ghost nor a lost daughter. Your presence in this world carries weight and significance. You are real. You are worthy. You are loved. Know that you are supported in your quest for wholeness, that my love for you is an ever burning blaze, even in your darkest of moments. It doesn’t make you a bad person, per se, to give your child up for adoption, especially if you have not been told the full truth about the potential risks adoption brings your relinquished child’s life, not to mention anything about yours. What you need to know is that adoption will break you in ways you did not know you could be broken. Adoption can also break your child in ways that you had no idea a child could be broken. This damage – this breaking along the fault lines of your soul – compounds across the years. It is not a one time thing. It gets bigger as it spreads, like a tsunami traveling across a deep ocean. And while you are not “bad” for choosing to relinquish your child for adoption without full knowledge of the truth, you will be treated as if you were “bad.” The moment you sign the voluntary termination of parental rights paperwork, you will be treated like there was something defective in you, which is why you don’t deserve to have any kind of relationship with your child. After all, what kind of woman gives their baby to strangers???? And when you wake up from the adoption-industry induced anesthesia and discover the depth of injury you have caused your child and you are crazy with grief, society (and even perhaps the adoptive parents and your once-upon-a-time child) will point at that grief as “evidence” that you were “bad” and didn’t “deserve” your child. So think carefully about the adoption “decision” and the potential long-term devastation you are inviting into your child’s life, even if you think you are choosing “good” adoptive parents. Your child wants only you. You and you alone. Be your child’s hero. Not some white infertile couple who has a slick advertising book on some corner of the internet, boasting about all their Stuff and all the Things. Your. Baby. Wants. You. Your. Baby. Needs. You. And, if after saturating yourself in the true facts of the cost of adoption to your child’s long-term mental health, you still relinquish your child for adoption? Then yes, yes you are a bad person.